» Product Reviews » Furmax Gaming Chair Review, Actual Comfort For The Cost? It’s time to review the Furmax gaming chair since it’s the once I decided on while looking for something comfortable that wouldn’t absolutely break the bank. Question is, is the Furmax gaming chair comfortable enough for what you pay? When I think of someone in the market for a chair of any kind for their PC I think that they are simply looking for something that is comfortable, that it’ll last a long while and that it doesn’t cost too much for what it is. That’s what I’ll go over here. I’ve had enough time with chair to say whether or not it’s a winner. First thing’s first, let’s go over the overall comfort of this chair. I managed to pick up the white version a little while ago and it seems that they have changed it over to this light blue version since then. Odds are that they ran out of stock on that color and had to change it over to this other one to compensate. Either way, it’s the exact same design so the comfort level is still going to be exactly the same. The lumbar support is my favorite part about this chair. 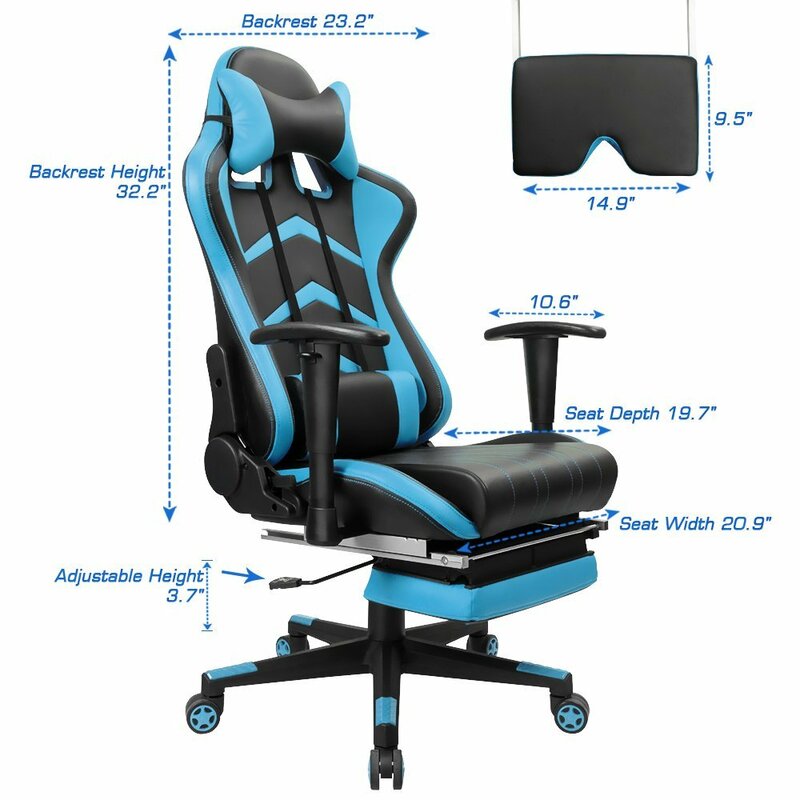 Other chairs that are marketed as “gaming” chairs have similar lumbar support but it can cost upwards of ~$300+ to get something to that degree. The pillow with this one is easily adjustable, it’s got a nice amount of high quality cushion to it and it just feels right. Before using this chair I was using a basic office chair that didn’t have any sort of lumbar support and the difference just with that alone is worth noting. As far as the other portions of comfort, the arm rests could have used a little bit more work. They’re sturdy and don’t get me wrong, they’re also high quality. They’re made out of a thicker padding. But they can’t be moved left or right from their position. This leaves me to being forced to get used to their position and move my keyboard/mouse according to how the arm rests are positioned. You are able to adjust them up and down a fair amount though. The head pillow is the same material as the pillow for the lumbar support. I like the way it’s curved, my head feels just right with where it is positioned. It’s also able to be moved up and down to your liking and simply slides onto the head part of the chair. The footrest is a big feature for this chair and it is nice enough to where I can see why they added it in. It simply slides out from under the chair then folds out. It’s sturdy to the point where you could even push down a bit of pressure to it and it’ll still hold its own. The max weight listed for this is 310 lbs. so it had better be able to handle it! As far as assembly goes, there were a few moments of frustration which is partly on mistakes I made as well as some parts of the instructions not being entirely clear. I’ve tried to find a PDF of the instructions but the manufacturer’s website isn’t clear to me where I’m able to find the right page for it. It’s in a language that I don’t understand. With that however, the instructions were easy enough to follow. The pictures are clear, it’s clearly shown which way the screws have to go into certain parts of the chair and the step by step instructions are in the correct order. But there were some pieces that were incorrectly labelled. For example, part “G” was actually part “D” along with other labels being incorrect. Also, only some of the parts had the labelling on it. Luckily the pictures shown in the instructions show pretty clearly which parts is which so as long as you follow it correctly, you should be able to get the right parts to go together how they were meant to go. Another part of the assembly that bothered me was that some of the holes that were cut out on some of the parts weren’t cut out optimally. Either the hole would be too small to where I’d have to force a screw in or it wasn’t exactly over the hole to where the screw could easily go in. Obviously still doable and after all was said and done, the chair looks just as it does in the product pictures. It would have been nice if the assembly overall was a bit of a smoother experience. The footrest was easier to put together than what I initially thought, though I had put it on backwards at first. Sometimes when walking by the chair I’ll scrape against the metal of the footrest since the metal sticks out a fair bit but it’s nothing that would make the chair not worth getting. All of the hardware you need will come with, mine even came with a few extra pieces of hardware. It even came with the correct type of wrench which was easy to use. Is The Furmax Gaming Chair Worth Getting? All in all, I’d say that it is packed with more features and quality parts than some of the lesser chairs on the market and it feels like it’s going to stand the test of time. It would have gotten a 9 or maybe even a 10 out of 10 from me had the instructions had the correct parts labelled and if some of the holes were better placed for use. 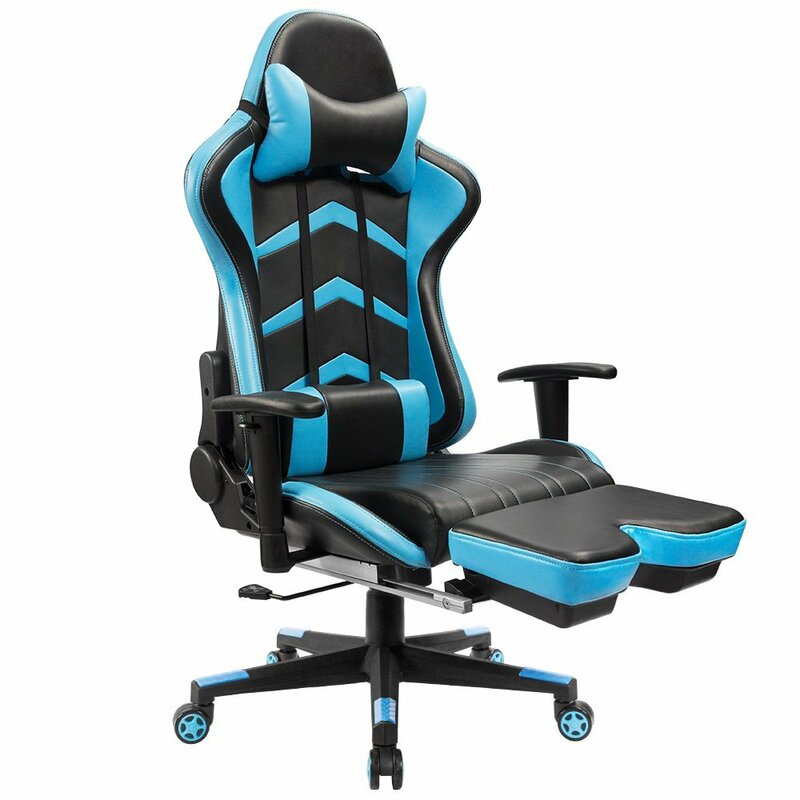 But for around $150 you get a chair that has excellent lumbar support, a nice headrest, made out of high quality material and has a footrest as an extra bonus. Most chairs of this quality and similar features are double the price. Don’t just take my word for it though, there are plenty of reviews over on Amazon as well that have good things to say about this one! Hopefully the other color choices will be available sooner rather than later, the white version that I have looks amazing! I’m sure other variations would look awesome as well. So, are you in the market for a gaming chair? What is your favorite part about this one from Furmax? 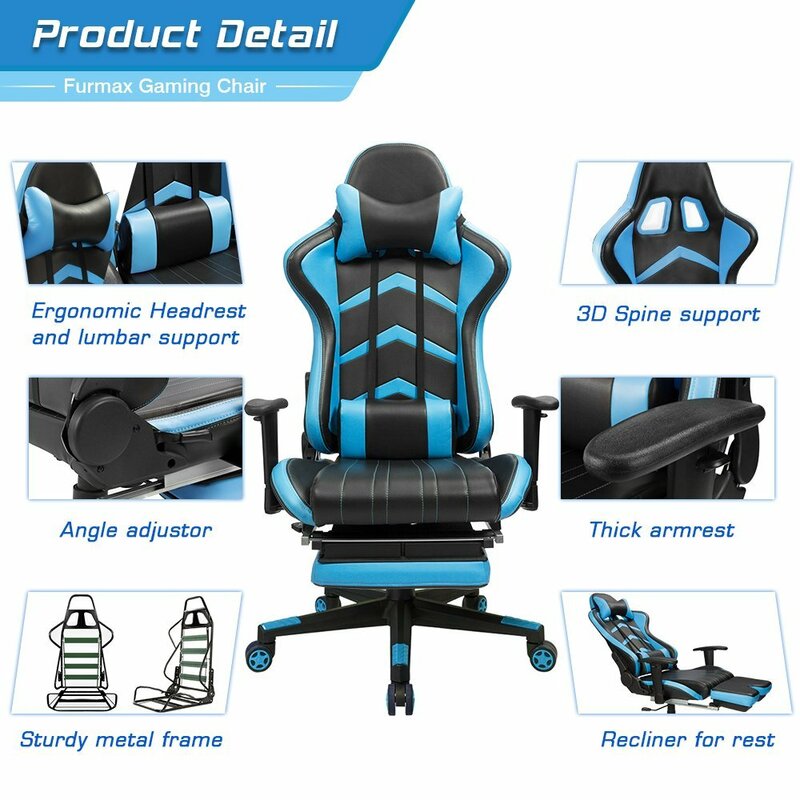 Tagged comfort, features, furmax, gaming chair. Bookmark the permalink.